Two caramel recipes in one week, what a great way to start off the season. Although it's interesting that the recipes use two different ways to make caramel. I'd like to know why that is, I'm sure there's a culinary reason. First, caramel corn. I love popcorn more than most people, but I prefer savory popcorn, not sweet. From now on, I'll make an exception for this amazing caramel corn. I popped the popcorn in my Whirley-pop, a pot specifically designed to make popcorn perfectly. I can't live without it! The timing on this recipe was tricky. Warm the bowl, toast the peanuts, make the caramel, and toss it all together. I let the caramel get a bit too dark, and it was difficult tossing it with the popcorn. It didn't get coated evenly, but in the end I liked the look of it, some light pieces and some dark. After letting it cool on trays, I admit I couldn't stop munching on it while taking photos. It's like Cracker Jacks! A perfect fall treat, and not too difficult to make, but dangerous to have around the house. Second, caramel apples. I've never been a fan, simply because they're so hard to eat! Why put something on a stick if you can't eat it directly off the stick? But they are pretty and the topping possibilities are endless! I was intimidated by the dipping process, and was delighted when they came out well. This caramel was different from the last, and I'm not sure why. I kept it fairly thick, and was able to dip 5 apples. Working quickly is a must! Having everything ready to go is essential. I had a little station set up: apples, caramel, nuts and chocolate. I considered keeping a few apples plain, just with caramel, but decided to follow the recipe. You could try this with any kind of nut, or chocolate chips, or white chocolate drizzle, or anything your heart desired. 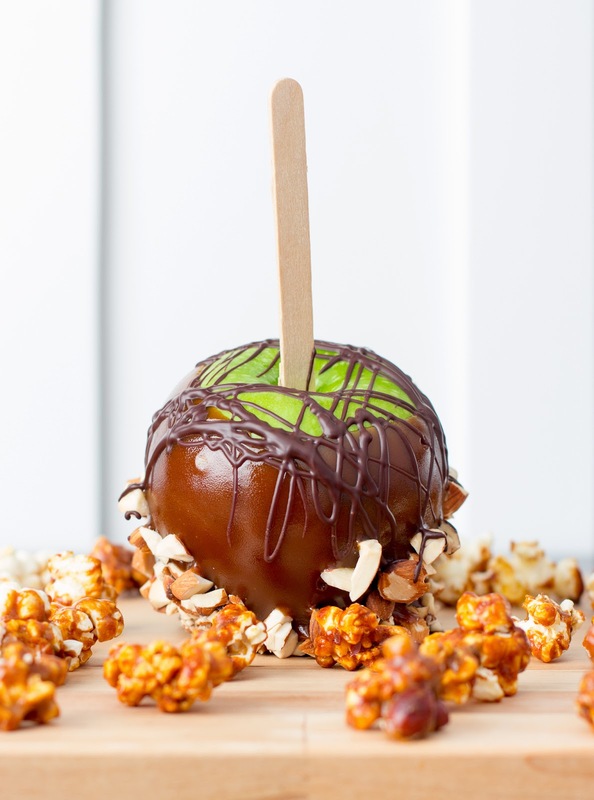 The green of the apple is a nice contrast to the caramel and dark chocolate. I surprised myself with this one, they turned out beautiful and so professional-looking! Since it was Halloween, I bagged a few up in festive cellophane and handed them out to neighbors. A treat for all ages! Caramel apples always brings me back to my childhood and celebrating Halloween - bobbing for apples and dipping them in caramel. I never actually liked eating them though because there was too much apple. I decided for this recipe I'd make miniature caramel apples! I loved how they turned out. I cut the caramel recipe in half to adjust for the much smaller sized apples that I had. I had to be much more careful making the caramel because I didn't have much in the pot and it was close to burning before even reaching the temperature listed in the recipe. I pulled the caramel off the stove when it was pretty dark. Then I coated the apples, sprinkled on a bit of fleur de sel and placed them on silpats to firm up. I've never actually done caramel apples so I wasn't sure when they'd be ready. They never actually harden but remain rather pliable. I tried wrapping some of the caramels in cello and placing some on mini muffin liners but the caramel was just getting stuck and I wasn't sure how to deal with it so I served them off the silpat-lined baking pan, not ideal. As far as flavor, I would have preferred the caramel a little less dark so it would be a bit sweeter in contrast to the tart apples. I did like my addition of fleur de sel. Another thing I might do next time is to chill the apples first so when I dip them, the caramel hardens more quickly instead of dripping and puddling at the base. All in all, a fun Halloween activity!